Many years ago I worked with an older re-recording mixer who during an ambience predub one day sardonically commented “ambiences are basically just filtered white noise…” We were joking around, but ever since I have wondered about that comment. On one hand it feels a bit like those people who see a photo shot on film and comment ‘Why bother with film – I could do that in Photoshop!’ without ever realising how misguided their comment is. The issue is not whether you ‘could’ do something, it is whether you actually do it or not. Similarly I could become an astronaut, but it is a meaningless & frankly delusional statement as there is no achievement in hypothesising about what one could do. But still I wondered: could someone really create realistic ambiences using nothing but filtered white noise? 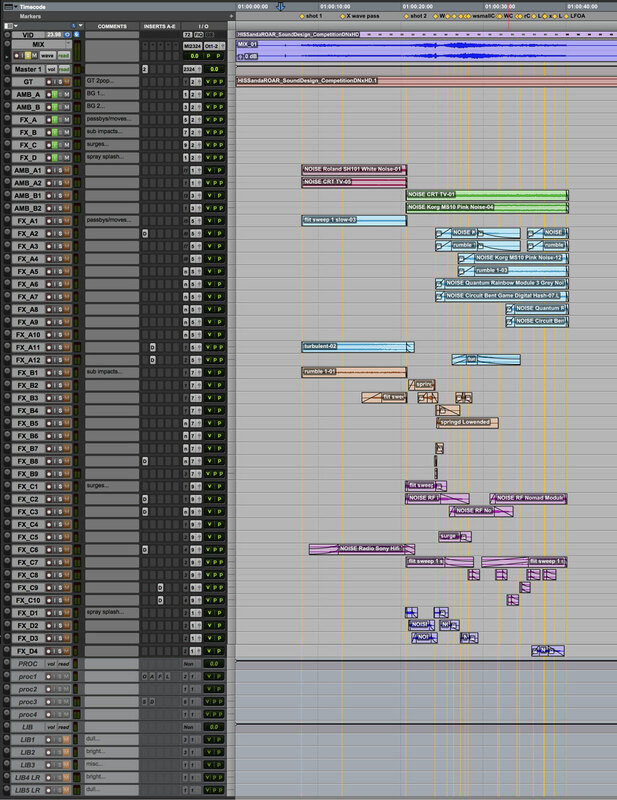 When I launched this first Sound Design Challenge I actually wondered if it was really achievable. Would all the entries be unrealistic and unpleasant to listen to? Within ten hours of launch the second entry eliminated those fears, with a soundtrack that would be a challenge to distinguish from the real thing in a blind A/B test. And it went on to provide a bench mark that few surpassed. Well done Nicolas Titeux! If you really really wanted to, you could work 12 hours a day for the 14 days of the challenge. There would be a fairly good chance the end result would be very good, but it is totally unrealistic. 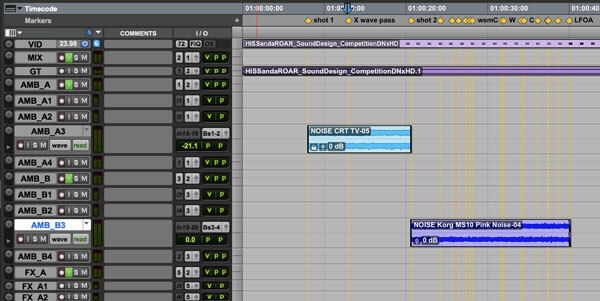 If someone hired you to edit ambiences for a film based on having seen your finished soundtrack, and you worked at the same pace, you would likely be fired by week 2. How good could I be in the time allowed? Before I actually start doing any work I am going to consciously estimate the time involved in this task, so I know if I am running behind schedule or spending too much time on a detail, since the end result is all that matters. Having already watched the video a few times I am pretty sure I can get a first version done in a couple of hours. I would then put it aside, and revisit with fresh ears, refine the elements and then output a mix. I would then revisit it a third time, again with fresh ears, check the existing mix, make some changes & output my final version. Total time estimate = 4 hours. OK step 1 – download the source material! 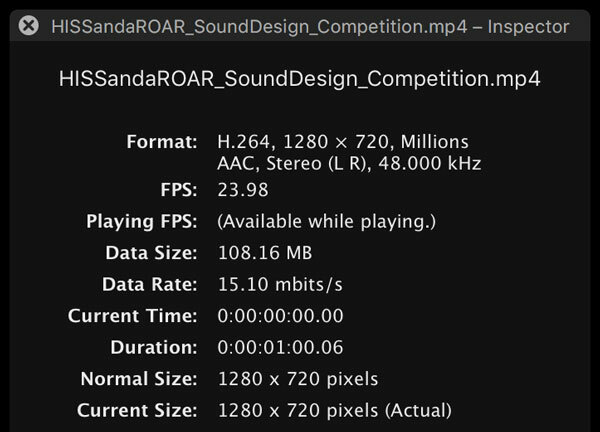 Decompress the rar file and first thing I then do is open the video file in Quicktime Player and Get Info on it – what format & frame rate is it? OK its 720p 23.976fps H264 MP4. As anyone who works in post knows, MP4 is a delivery format NOT a working format (due to it using inter frame compression playing forwards is ok, playing backwards or scrubbing is very slow as it has to reconstruct each frame from previous frames). At this stage many people would open from a saved template, but I will quickly assemble a simple session. My usual working format is 24 bit 48k, I then import the video and the guide track audio (for the 2 pop) to the start of the session, and then set the sessions timecode start to match the burnt in timecode of the video 01.00.00.00, also checking my timecode timeline matches the video frame rate of 23.976fps. The final video soundtrack is only stereo, so I create some stereo stem tracks (AMB-A, AMB-B, FX-A, FX-B, FX-C, FX-D) plus a master stereo MIX track. And then I create some audio tracks to feed each AMB stem: 2 C and 2 LR tracks for each, and source tracks for FX: 4 C and 6 LR for each stem. I quickly name my tracks. I also create some processing audio tracks, for printing plugins. I quickly do all the bus-ing, and set the stems and master track to input monitoring. Then I import the 18 source audio files and I am ready to start work. Before I listen to any sounds, or start doing any sound design I watch the video a few times and think about it, analysing it. Ok so there are two shots – they are clearly shot at different times of the day and in different locations. 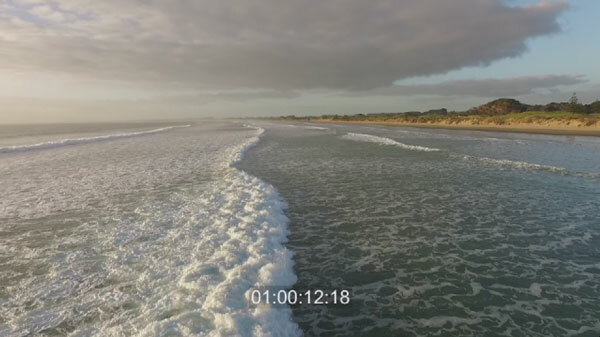 The first is a drone shot taken side on to the direction of the waves, out to sea a bit with rolling waves passing camera. 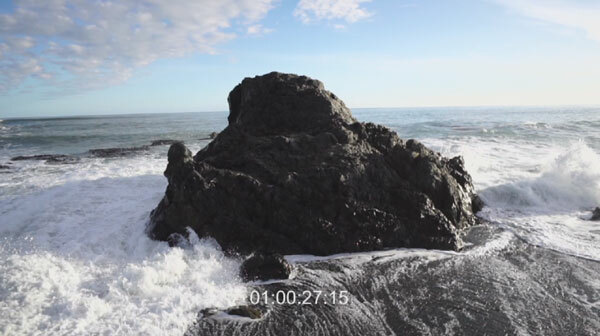 The second is shot from the beach, with waves crashing on to rocks. Given the perspective and point of view of the camera these two shots should sound & feel quite different to each other – the first is almost gentle, while the second is more powerful – the wave fair pounds that rock and a lot of water pours in around the rock. I also notice all the weird back waves – that second shot is going to take a lot of elements and a lot of panning! Shot 1 is quite beautiful and a fairly unique perspective – it feels like late afternoon, almost dusk. It looks quiet peaceful. Shot 2 feels a little dangerous. If I stood down in front of that rock I would definitely get wet and possibly knocked off my feet. 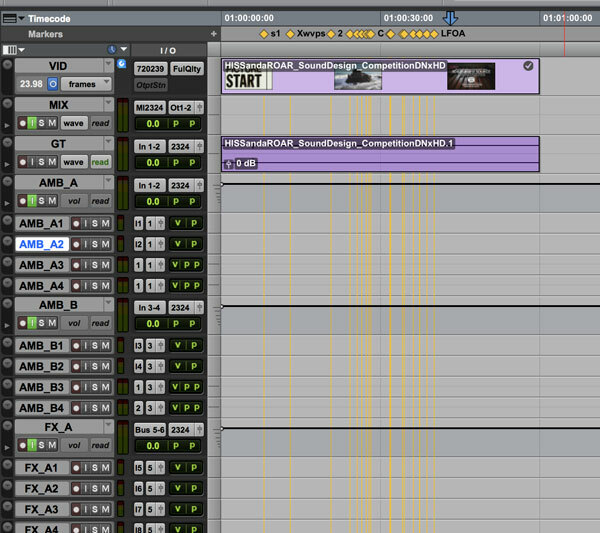 Now to find the main sync points within the shots. OK I have finished spotting the film – I have sync markers for all action and a clear idea of how I want the end result to feel and what I need to create from the source material… I’m 30 minutes in and it is now time to get busy! I don’t know about you, but I prefer to have all the source material available on tracks. When they are all sitting in the Region Bin you can’t reorganise them, or re order them or make comments on them… So I make a couple of new audio tracks (3 C and 2 LR) and name them LIB 1 – LIB 5 and I drag all of the 18 source files on to those tracks, but further along the timeline, so they are away from my video & edit session. I drop a marker on the first library sound and edit the marker number to 99, so as to make a mental note and I can then instantly jump back here at any time later on, by hitting 99. on the numeric keypad. Quickly skipping through the files I listen and then reorder the sounds, putting the bright harsh sounds on one Lib track, the dull sounds on another & the misc on a third track. Shot 1 we are out at sea, so the general ambience will be fairly inactive – just a diffuse gentle roar, no waves are actually breaking & the shoreline is too far away to worry about. Shot 2 we are on a gravel beach, so it can be a little brighter.. but there are a lot of other elements to go into that shot so I dont sweat the details too much. I select some mono files and create a stereo ambience by offsetting parts of the same file, place them & edit them to length paying particular attention to the start of shot 1 (I don’t want the ambiences to start too abruptly or bump in too hard) but I do want the shift from shot 1 to shot 2 to feel dramatically different, so I make that a fairly hard cut. I set some relative levels using volume automation and I now have a very basic ambience bed to work against & layer elements over. Next I am going to generate some variations of the passby for shot 1 – I check the timing, duration is 12 seconds with a 5 second approach and 7 second away. I like the way the wave is not breaking but almost bubbling, and quiet turbulent. The processing I try I will apply to a few different source files, just so I have some options. The processing I try I will apply to a few different source files, just so I have some options. And then I will try putting the results through a Doppler plugin, to get a natural sounding passby… bearing in mind I need at least 5 second approach & 7 second away… But I will also try some faster, shorter passby variations just for detail when the wave pass is close to camera. Automating The Drop filter LPF I try to be careful that you cannot hear or perceive a frequency sweep – too much resonance and it gives it away…. Once I have a good balance, I solo the elements feeding each stem, to see how they are working and that there is no redundancy/unnecessary elements which might mask other more important elements. I prefer to work in stems as it allows me to logically group elements &rebalance the group using stem automation. I am not a fan of using automation instead of actual editing – if there is an impact, it should be from a seperate element that is only contributing impact, not a part of a general track that is getting a push in automation at that point to create impact. If something is leaving your facility or studio, you MUST do a reality check & final Quality Control, verifying that the delivery version matches your final version. If you skip this step you fail at post production. I was really surprised that two people submitted Youtube links to me that clearly had faults – one was entirely mute, and another had second long silences in it. I offered both people a second chance as I wanted to hear their work as they intended it. But… if they do not learn a lesson from this incident, the next time they do something like that it could cost them their job, as it might be a director or producer who does not give you a second chance. QUALITY CONTROL = ALWAYS REALITY CHECK YOUR WORK! Final comments: this was an interesting challenge, and while my mix & panning could do with more work, I am ok with the end result… Of course it will never play this loud in a film, but having elements split to stems it would be easy to rebalance the mix without having to get amongst the source tracks…. I have a clear idea for the next SD Challenge – it wont be for a month or two,a s it will be for a library I have not started recording yet. But the source material will lend itself to music as much as sound design, so I look forward to hearing what you do with it!